KNIME Server is an enterprise-grade solution for Advanced Analytics workloads such as sharing workflows, and executing workflows. The Server is based on the Tomcat application server, and uses a core of KNIME Analytics Platform in order to execute workflows. The KNIME Server installer can install both of these components that make up KNIME Server. This document aims to give a quick overview of the steps needed to perform the installation, and a short description of the options that can be changed at install time. After installation, you can refer to the KNIME Server Administration Guide for detailed information about the Server architecture, configuration options and general administration tasks. 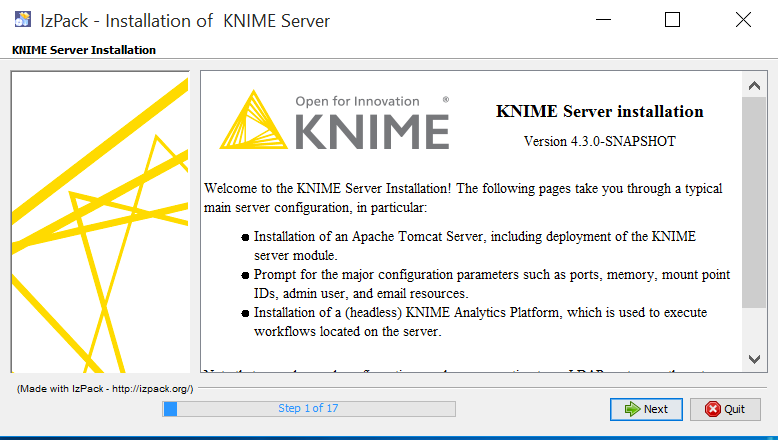 More details about the functionality of KNIME Server are listed in the following paragraphs. KNIME Server provides KNIME software users with a shared remote workflow repository. Workflows can be uploaded to and stored on the server or retrieved from it to a local KNIME workspace. Workflows on the server can be executed as jobs either as needed or as part of a one time or periodically scheduled event. Additionally, workflows may be executed through a web browser using the KNIME WebPortal or via generic SOAP or RESTful web service interfaces which allow control from 3rd party applications. The KNIME Explorer view, which is built into KNIME Analytics Platform can be used to log into remote repositories, control user access permissions and schedule workflow execution tasks. KNIME Server consists of two components: a server side component and a client interface. The server side component is installed on an application server (Tomcat) together with a KNIME Analytics Platform installation which will be responsible for executing workflows. The latter is referred to as "Executor". The client interface allows interaction with the server repository and is integrated in KNIME Analytics Platform (via the KNIME ServerSpace extension), and KNIME WebPortal, or accessible via the REST API. The server may also run on other operating systems, however, we neither test nor support them through the KNIME Server standard support package. Note that JDK >= 9 is not supported at this time. We recommend that both the Tomcat server as well as the KNIME Server Executor are installed by the same user. This user does not need administration privileges. The recommended user name is knime. No other user requires write access to any files created during the installation. This user must do the entire KNIME Server Executor installation including unpacking of KNIME Analytics Platform and installation of all desired additional features. If additional features are added later with a user that cannot write to the installation folder, the installation may appear to work normally, but causes problems some time later which can be difficult to track down. It is recommended that the entire installation process is performed by the same user, e.g knime (see The installation owner above). Don’t install the server as Administrator or root user! Follow the installation instructions step by step. Don’t skip anything unless it is marked as optional. The KNIME Server installer is a single JAR file that works on all supported platforms (Windows, Linux, macOS). Use of the JAR file is described in the following sections. We briefly describe the installation options available in this guide. For full details about any of the options see the KNIME Server Administration Guide. Before you start, make sure that the Java 8 JDK is installed (see Prerequisites). The Java JDK version must be 1.8.x, and you should use the browse button to the select the folder that contains the bin folder. The installation folder will (by default) contain all of the files that KNIME requires, which includes Tomcat, the KNIME Server Executor and the KNIME Server repository. The installation folder should be empty, and if it does not exist will be created. If prompted choose OK. Select existing KNIME Server Executor (default): This means that you need to have previously installed a compatible KNIME Server Executor using one of the downloads from the KNIME Website. Note that the downloadable KNIME Server Executor build contains the required extension, but a standard KNIME Analytics Platform build will not be sufficient. In the latter case the "KNIME Executor Connector" (in category "KNIME Server Executor (server-side extension)") must be installed. The extension is available from the pre-registered KNIME Analytics Platform update site. To install it run the KNIME Analytics Platform instance that is intended to be the executor and navigate to File → Install KNIME Extensions…​ and select KNIME Executor connector under KNIME Server Executor (server-side extension). Finally, click on "next" and follow the instructions. Install KNIME Server Executor: This will install a new KNIME Server Executor, and will result in several additional steps that must be followed. Disable server-side workflow execution: This option means that workflows cannot be executed on KNIME Server. KNIME Server stores all workflows, and related configuration information in the KNIME Server Workflow Repository. The folder should exist on a local drive and have enough free space to store the workflows and jobs. We recommend a minimum of 100 GB, although this may need to be increased considerably depending on the intended use case. By default, the KNIME Server Workflow Repository is created within the KNIME Server installation folder. It is possible to use a different location (e.g. on another hard drive) or an existing folder. In case the folder exists, the installer will not modify the folder, assuming that you pointed it to the workflow repository of a previous installation. The KNIME Server application works only as expected if a valid license file is provided. If you have not received a license file, please contact KNIME (contact@knime.org), or get in touch with your local KNIME representative. If you performed the installation without the license file, you can simply copy the KNIME Server license file into the <knime-server-repository>/licenses folder. The file name must end with .xml, and there is no need to restart the server after adding the license file. KNIME Server and its clients communicate by either HTTP, or HTTPS. Default ports are 8080, and 8443. These ports can be changed in the range: 1024-49151. The KNIME Server mountpoint is used to describe the KNIME Server to the clients that connect to it. For simple installations, the default name, or a simple name e.g. mycompany-knime is usually appropriate. For an environment with multiple KNIME Servers, mountpoints such as knime-server-prod or knime-server-dev would allow users to distinguish between development and production environments. For a full description of the mountpoint see the KNIME Server Administration Guide. Many administrative tasks on KNIME Server can be performed by the administrator user, e.g. setting workflow/file permissions, adding/removing users. The default username is knimeadmin, and the password is set to the hostname of the machine. It is strongly recommended that you change this password. If using LDAP authentication changes are required to the server.xml file in <installation-path>/apache-tomee*/conf. Please refer to the KNIME Server Advanced Setup Guide for full information. The SMTP server, SMTP user, and 'from'-address can be altered. For advanced configuration options consult the KNIME Server Administration Guide. The final four steps will install, and if successful launch KNIME Server. Under Windows a new command prompt window will appear, closing this window will shutdown KNIME Server. The penultimate page displays information about the installation, such as the URLs required to connect to the server. The final page is able to generate an automatic installation script that can be used to automate future installations. The installer reads out system properties specified on command-line, which are usually not required in a standard installation but can be useful for automated (update) scripts. The value specified is added to the KNIME Server Executor’s knime.ini file and specifies how much memory a KNIME Server Executor is allowed to use at most. If not given, a default is used, which is based on the system’s available main memory. If specified, KNIME Server is not started after the installation. KNIME Server can be started and stopped using scripts in the <tomee folder>/bin folder. It is highly recommended that you follow the steps in the following section Automatically starting KNIME Server, this ensures that KNIME Server can be quickly and easily restarted. After restarting you should be able to access KNIME Server from both KNIME Analytics Platform and KNIME WebPortal (in your web browser). More details can be found in the KNIME Explorer User Guide and KNIME WebPortal User Guide. If you encounter problems please have a look at the log files (see section Log Files in the KNIME Server Administration Guide for details). In order to start KNIME Server after a reboot, you need to define a service (Windows) or a runlevel script (Linux) that starts TomEE and brings it down at a machine shut down. Copy the whole folder to the root of your file system. The folder includes the systemd service description for knime-server, a start script, and a systemd override file that allows configuration of the service (such as file system location or the userid under which the server should run). Adjust the settings in the editor that will open, and save the changes. Make sure that the User specified in this file exists on the system. Otherwise startup will fail. or that is provided in the installation package to /etc/init.d/knime-server and make it executable. from the installation package to /etc/default/knime-server. Adjust the variables in this config file. If you want to start and stop KNIME Server automatically under Windows, you need to create a Windows service. Run the batch file at <tomee-folder>\bin\service.install.as.admin.bat as user Administrator. It will create a Windows service called "KNIME Server" that can be started and stopped like any other Windows service (Control Panel ⇒ Administrative Tools ⇒ Services). Go to the "Java" tab and change the "Maximum Memory pool" value. In order to uninstall the service execute <tomee-folder>\bin\service.remove.as.admin.bat as user Administrator. If you want to know more details, have a look at the Tomcat documentation which describes this process in detail. In places where the Tomcat documentation references "Tomcat7" executables, replace their names with TomEE.x86.exe or TomEE.amd64.exe depending on your architecture.